The Sudbury Neutrino Observatory began operating in 1999 at a depth of 2,070 metres below the surface in the Creighton mine near Sudbury, Ontario. The goal of the observatory is to detect and study neutrinos emitted by the Sun and other celestial objects. It is the product of a collaborative effort between Canada, the United States, and the United Kingdom. Neutrinos are small elementary particles that are electrically neutral (that is, they have no electrical charge). They interact very little with matter. So little, in fact, that matter is virtually transparent to them, and therein lies the difficulty in detecting neutrinos. Stars produce large amounts of neutrinos. The Sun, for example, emits 200 trillion trillion trillion neutrinos each second. Billions of neutrinos pass through the Sun, the Earth and your body every instant without being hindered. In fact, during your entire lifetime, only one or two neutrinos will ever come into contact with one of the atoms in your body. One of the major unresolved problems about our Sun is related to its production of neutrinos. 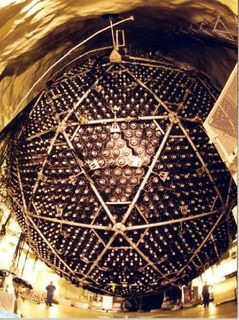 In the early 1980’s, it was realized that the number of solar neutrinos detected by various laboratories were less than predicted by theoretical calculations. Two hypotheses were proposed: either that our knowledge of the Sun is insufficient, or that some of the neutrinos change their form during their voyage to the Earth (this phenomenon is known to affect other elementary particles), which would mean that the number of neutrinos reaching Earth is less than the amount originally emitted by the Sun. In 1983, Canadian researchers proposed the construction of an underground neutrino detector in an Ontario nickel mine belonging to the company Inco. 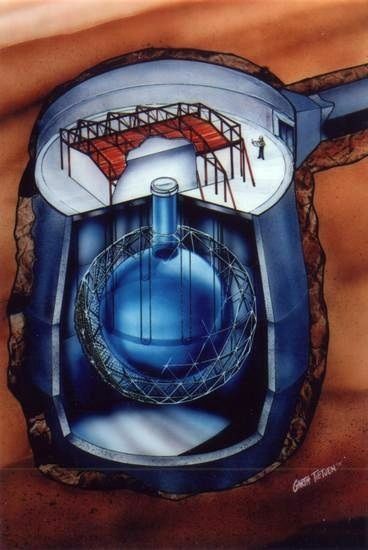 The underground site would shield the detector from microwaves in the background cosmic radiation, which would normally impede the detection of solar neutrinos. One year later, in 1984, an American researcher published a study that demonstrated the advantages of using heavy water (water in which the hydrogen atoms each have an extra neutron) as a neutrino detector. Since Canada has an abundant reserve of heavy water, it was decided that the facility would operate as a heavy water detector. The United States joined the project, follow by the United Kingdom in 1989. Work began in 1990 and was completed in 1999. The detector consists of 1,000 tonnes of ultra pure heavy water enclosed in a transparent plastic vessel measuring 12 metres across. The vessel is itself enclosed in 7,000 tonnes of ultra pure normal water, lodged in an immense cavity measuring 22 metres wide and 34 metres high (the equivalent of a 10-storey building). It is the largest underground opening ever excavated at two kilometres depth. The acrylic vessel is surrounded by a 17-metre geodesic dome equipped with 9,600 detectors that sense the presence of neutrinos. The frequency of neutrino detection is one per hour. The results from the Sudbury Neutrino Observatory have demonstrated that neutrinos do indeed change their form during their trip from the Sun to the Earth, thus putting an end to the debate. They also have demonstrated that neutrinos do have a mass, and for this major discovery Arthur B. McDonald, director of the Sudbury Neutrino Observatory, won the 2015 Nobel Prize in Physics.